It wouldn't have been a bad bet to expect a Tulsa starting pitcher to take home Pitcher of the Year honors at the start of the season. Tyler Anderson might not have been the favorite, but on Thursday, the left-hander nabbed the hardware anyway. The Rockies' No. 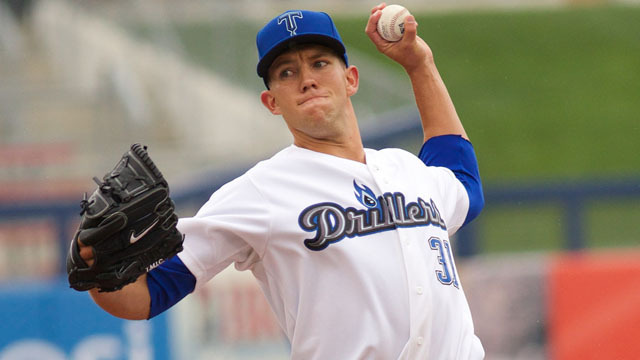 12 prospect was named the Texas League's Pitcher of the Year after setting career highs for starts, ERA and strikeouts. Also picking up honors was Angels infield prospect Alex Yarbrough, who was named the Texas League's Most Valuable Player. Anderson began the season sharing the Drillers' rotation with top prospects Jon Gray and Eddie Butler, as well as breakout performer Daniel Winkler. Gray went on to have a strong-but-unspectacular season, Butler missed time due to injury and Winkler -- the league's best pitcher in the first half -- underwent Tommy John surgery in June. And so Anderson was left to be the rock in Tulsa's rotation. The 24-year-old has been up to the task, posting a 2.08 ERA in 22 starts with 100 strikeouts in 112 1/3 innings. He has been especially good down the stretch, posting a 1.66 ERA in 11 second-half starts. The 2011 first-round pick (20th overall) projected as a fast-moving starter when he was drafted, but the Oregon product was held back by injuries for his first few pro seasons. He kept his health through 2014, though, avoiding the disabled list until this week, when Colorado put him on the seven-day DL with an undisclosed injury. The Denver Post reported that there isn't a serious injury, though, and the team is just resting him for the Drillers' postseason run. Yarbrough, ranked eighth in the Angels' system, provided Arkansas with a jolt of offense from a premium defensive position. The second baseman has hit .285 with a league-leading 38 doubles. Yarbrough's been especially good down the stretch, hitting .293 in August as the Travelers locked up the Texas League North Division second-half title. Among the other All-Stars are three Frisco RoughRiders, including Rangers' top prospect Joey Gallo. The third baseman was also named MVP of the Carolina League on Thursday, hitting 21 homers in Class A Advanced before clubbing another 20 in Double-A.